YOUR BEST SOURCE FOR PRO AUDIO GEAR. 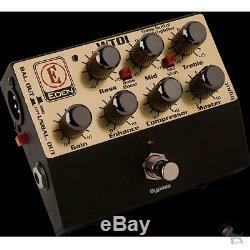 Eden WTDI World Tour Direct Box/Preamp DI Bass Pedal 3 Stage EQ + Power Supply. The WTDI embraces powerful tonal shaping and control in a super compact DI pedal. Featuring a 3 stage EQ, Bass Boost and Mid Shift buttons. Whether it's for the home studio, professional studio, live stage work or simply as a backup for your touring rig, you simply cannot afford to be without this simple yet effective tool. Taking the concept of DI boxes to the next level! Output Jack: 1/4 & XLR. Power Requirements: 15V supply included. The item "Eden WTDI World Tour Direct Box/Preamp DI Bass Pedal 3 Stage EQ + Power Supply" is in sale since Monday, July 31, 2017.